Rice paper stand up zipper pouches have a unique fiber pattern and textured feel to provide a “high end” finished look. 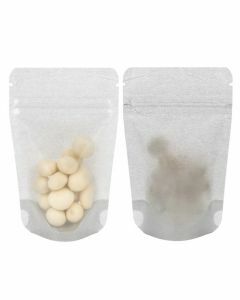 They feature a crystal clear window that runs the width of the bag allowing your product to be seen. Zipper Pouch Dimensions * Please note that all volume & bag sizes are estimates and are based on tests using coffee beans. Free test samples available upon request. This silver rice paper stand up pouch is perfect for individual portions of tea, coffee, mixes, nuts, and more. Our ZBGR1SS pouch measures 3 1/8" x 2" x 5 1/8" and holds 1oz/28g of dry goods. The solid silver front panel offers a unique, textured look and ample space for branding. Features include a resealable zipper closure and tear notches. This item is currently sold with NO HANG HOLE. Due to popular demand, it will soon come stock with a round hang hole. Check this table to see when it will be available with the hang hole. 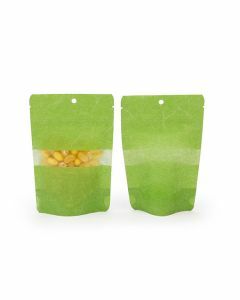 At 3 1/8" x 2" x 5 1/8", this green rice paper zipper pouch is perfect for packaging smaller portions. This pouch holds 1oz/28g, ideal for single servings of coffee beans, tea leaves, powdered mixes, and more. A crystal clear front window shows off your product, while the green textured material provides a one-of-a-kind look. Food safe. This item is currently sold with NO HANG HOLE. Due to popular demand, it will soon come stock with a round hang hole. Check this table to see when it will be available with the hang hole. The smallest of items can create a memorable impression in these silver rice paper zipper pouches. ZBGR1SC measures 3 1/8" x 2" x 5 1/8" and holds 1oz/28g. 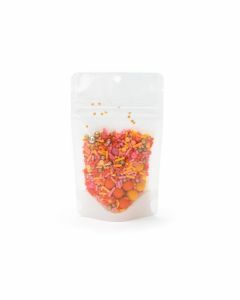 This pouch is ideal for candy, taffy, sea salts, toffee, spices, and more. A clear front window gives customers a full view of your product. Features include an airtight zipper closure and easy tear notches. This item is currently sold with NO HANG HOLE. Due to popular demand, it will soon come stock with a round hang hole. Check this table to see when it will be available with the hang hole. Create a high-end look for your product with this 3 1/8" x 2" x 5 1/8" rice paper stand up pouch with a clear front window and a solid black back panel. The ZBGR1BC pouch holds 1 oz of dry goods like coffee, mixes, and dried fruit. This pouch is made from laminated material for extra strength and features a resealable zipper and easy tear notches. This item is currently sold with NO HANG HOLE. Due to popular demand, it will soon come stock with a round hang hole. Check this table to see when it will be available with the hang hole. Single serve rice paper pouches are perfect for that cup of coffee or tea. 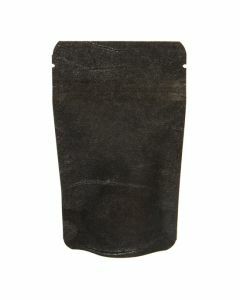 The ZBGR1SB is our black rice paper pouch that measures 3 1/8" x 2" x 5 1/8" and holds 1oz/28g of dry goods. Package coffee, tea, mixes, and more. This 5 mil pouch is designed with a unique fiber pattern. An airtight zipper and strong barrier keep products fresh. This item is currently sold with NO HANG HOLE. Due to popular demand, it will soon come stock with a round hang hole. Check this table to see when it will be available with the hang hole. 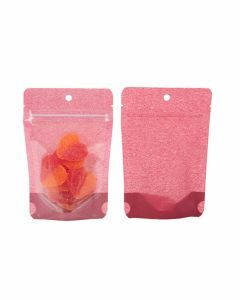 This stand up zipper pouch is an ideal way to package items such as sea salts, candy, dry mixes and more. Measuring 4” x 2 3/8” x 6”, this pouch holds about 2 oz of dry goods. Rice paper offers an unique textured look that gives off a “high end” feel while the green color leaves customers with a very earthy feel. Food safe. Now available with round hang holes. Some bags without hang holes may still be left to ship. Please let us know if you prefer them with hang holes in your order comments. 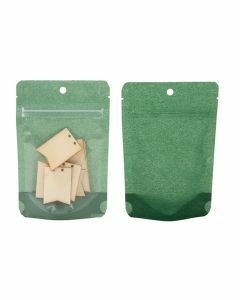 The refreshing look of this stand up rice paper pouch in harvest green is sure to be a crowd-pleaser. Our ZBGR2HG pouch measures 4" x 2 3/8" x 6" and holds 2 oz/57 g of dry goods. 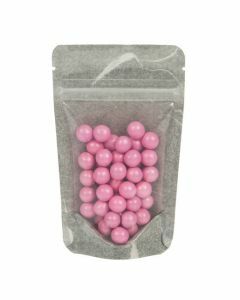 The front of the pouch is clear to showcase candy, tea, mints, bath salts, and more. Includes a resealable and convenient tear-away notches. Heat sealable. 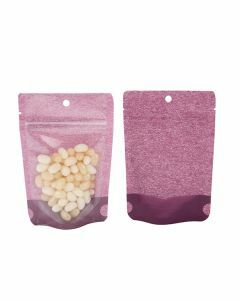 Create a stylish look with our rice paper stand up pouch in harvest cranberry. Our ZBGR2HR pouch has a rich cranberry color and a clear front panel to show your product. Package coffee, sprinkle mixes, cookies, spices, and more. 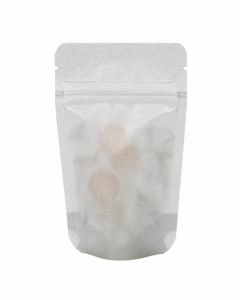 This pouch measures 4" x 2 3/8" x 6" and holds 2 oz/57 g. Includes tear notches and a resealable zipper. Heat sealable. 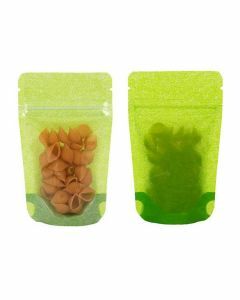 Our ZBGR2HP rice paper stand up pouch measures 4" x 2 3/8" x 6" and holds 2 oz/57 g. The front panel is clear to showcase your product. Package coffee, tea, chocolates, candy, and more. Includes tear notches and a resealable zipper. Heat sealable.